2500mm (w) x 1000mm (h) Frame including Qty 2 Printed Banners. 3000mm (w) x 1250mm (h) Frame including Qty 2 Printed Banners. 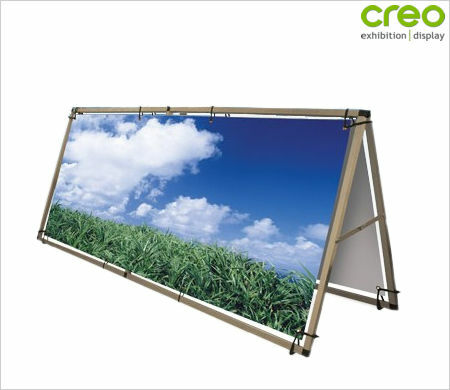 A large format single or double-sided outdoor A-Frame Banner Display, made from a lightweight aluminium frame for use with PVC eyelet Banner Graphics. The ideal promotional solution for indoor or outdoor events, exhibitions and promotions. Graphic Secured with adjustable looped elastics supplied. Supplied complete with guide pegs for securing to grass surface. Flat Packs for easy Transportation. Withstands winds 18-24mph approx (Beaufort scale 5). 98.43" (w) x 38.39" (h) x 25.20" (d) approx. 118.11" (w) x 47.24" (h) x 31.30" (d) approx. 2500mm x 1000mm frame 8kg (17.6lbs) approx. 3000mm x 1250mm frame 9kg (19.8lbs) approx. 2500mm x 1000mm frame 4kg (8.5lbs) approx. 3000mm x 1250mm frame 4.5kg (10lbs) approx.